Most years I'm ready for fall at the beginning of August. Last year in particular, I remember being SO ready to hang up the pool bag for good. Getting two little boys ready to go swimming, wrangling them while we were there, and then cleaning up when we got home wore me out. Even before I had kids, I loved fall because the weather can be so lovely, and the pumpkin goodies alone make it a great season. But something magical happened this year. I set out to make the most of summer since Ethan was starting Kindergarten this fall. I knew our lives would be changing with him being in school for 5 days a week instead of two. And I can honestly say that we had the most wonderful summer together. Don't let me give the impression that it was all sunshine and roses, though. Obviously life with two boys ages 5 and 3 is what you'd expect some days (or weeks). But I really didn't want summer to end this year, which is definitely a new feeling for me. We were truly having fun together. 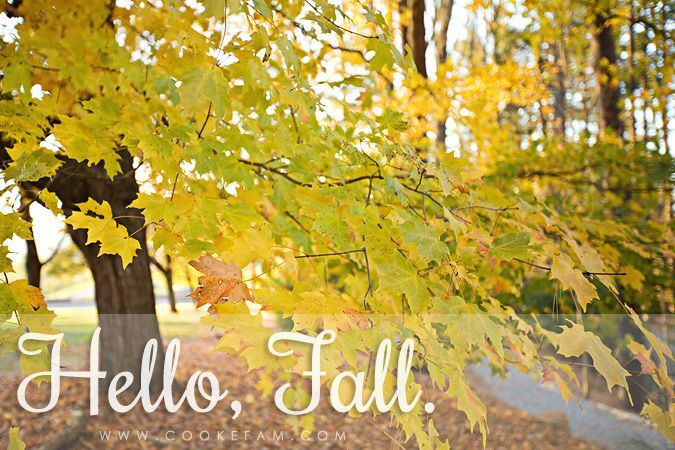 And fall meant not only a new weather season, but a new season of life for our family. But, of course, summer did end as all seasons do. And now that we've officially entered into the fall season as of this past Sunday, I can now say I'm ready. We're more than six weeks into school and it all seems normal now. And I'm shocked at how productive I am with just one kid at home. I really didn't expect that and it feels pretty good. Fall, you have my permission to commence.